A photo bracelet is a very special way to capture a beautiful moment and always carry it with you. It makes your piece of jewellery something unique that nobody else possesses in this way. It is something very personal. Names4ever makes it possible and gives you the opportunity to transform a beautiful moment into a photo bracelet. You can have any photo engraved. This can be a picture of your family, friends or a portrait of a loved one. 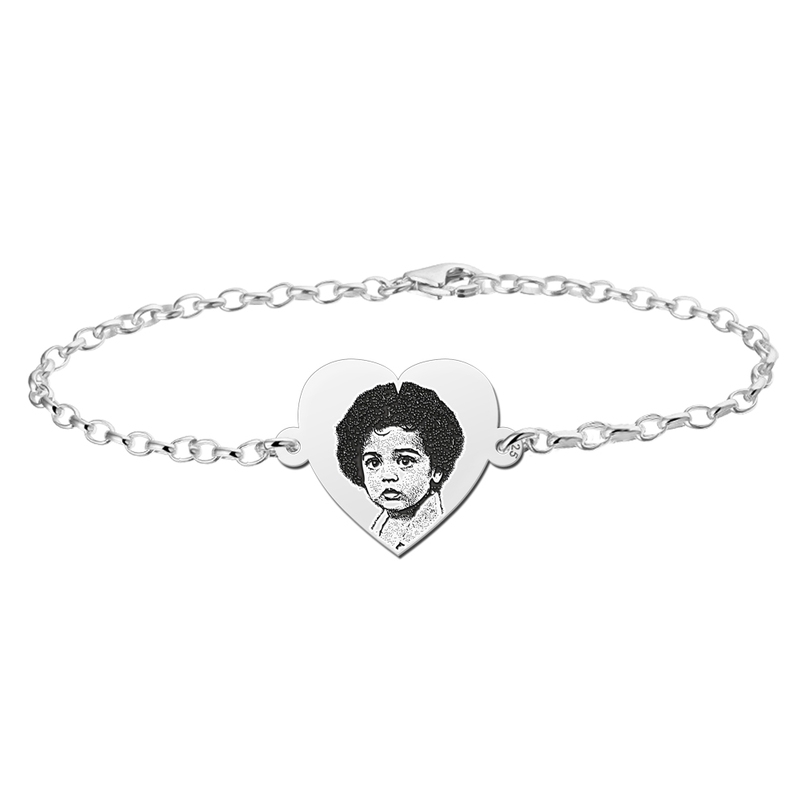 A photo bracelet is also very popular as a memorial jewelry of a deceased beloved person. 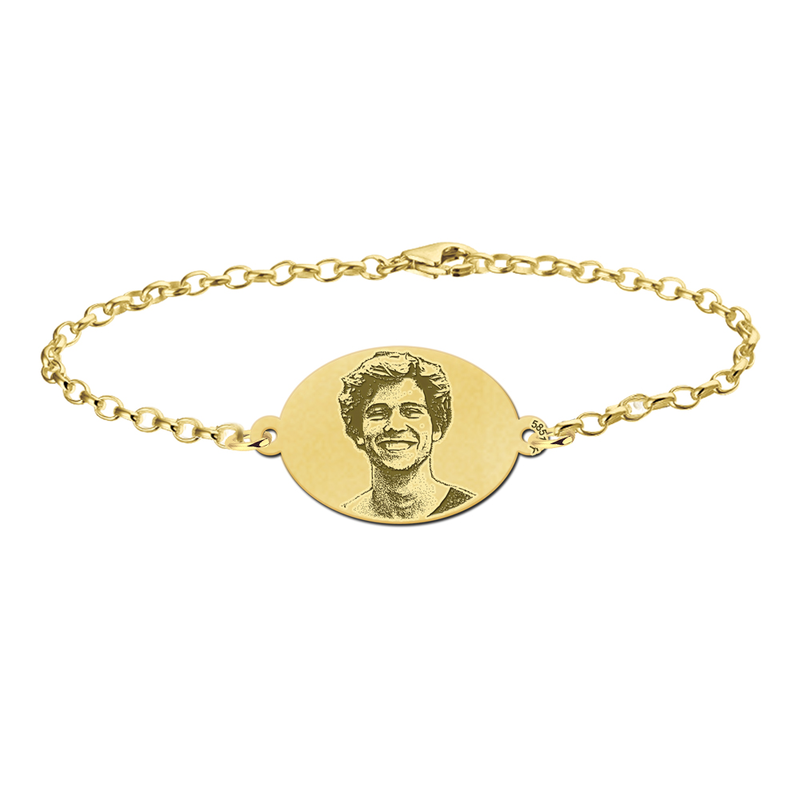 This way you wear a bracelet with a photo as a memory of this person always close to you. A photo bracelet is a very personal and symbolic piece of jewellery. It is of course also a great gift for special occasions. The occasion can be a birthday, birth of a child, an anniversary or even a memorial ceremony. Who doesn't like to get a photo book full of memories? So why not try something different and directly give a photo bracelet that you don't put on the shelf, but therefore always carry with you. Names4ever is an expert in engraving jewellery. Therefore we also offer the best materials. 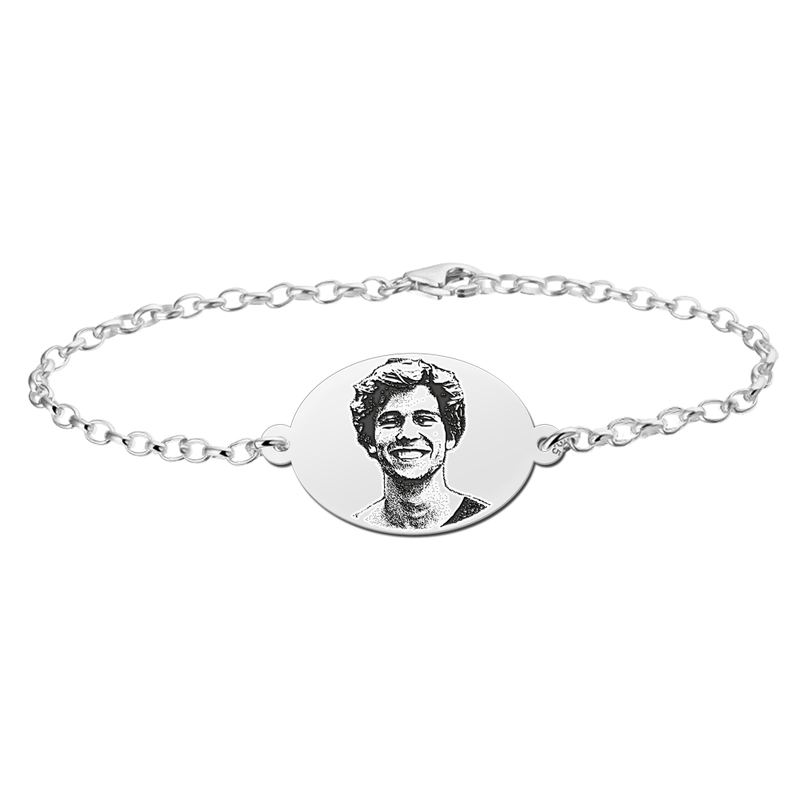 You can order your photo bracelet in silver for example. Our silver jewellery is made of high quality 925 sterling silver. Therefore our customers receive only the best quality. 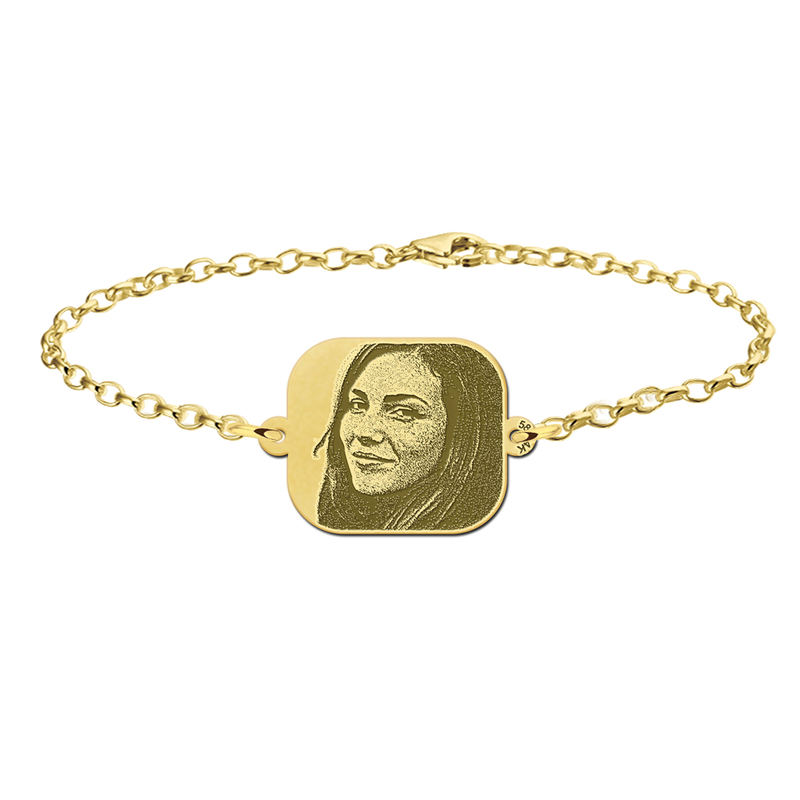 You also have the possibility to order a bracelet with photo engraving in 14 carat gold. This means that our jewellery is made of 58.5% pure gold, mixed with silver and copper. This strengthens the material and makes it stable. A photo bracelet can easily be fitted to any wrist and ordered in different bracelet lengths. We offer sizes from 16 cm, 18 cm up to 21 cm. The bracelet can be adjusted in size. In addition you have the possibility to choose between different variants, like a heart of a circle. Our jewellery has the same value as the jewellery of a jeweller. But at Names4ever you can easily have your piece of jewellery delivered to your home. 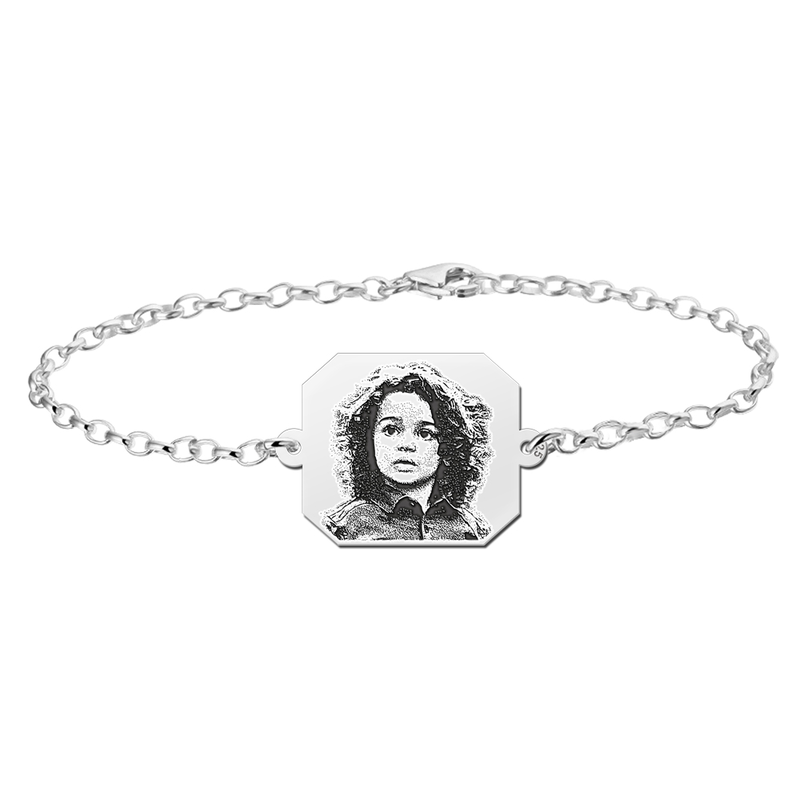 Ordering a photo bracelet: How does it work? 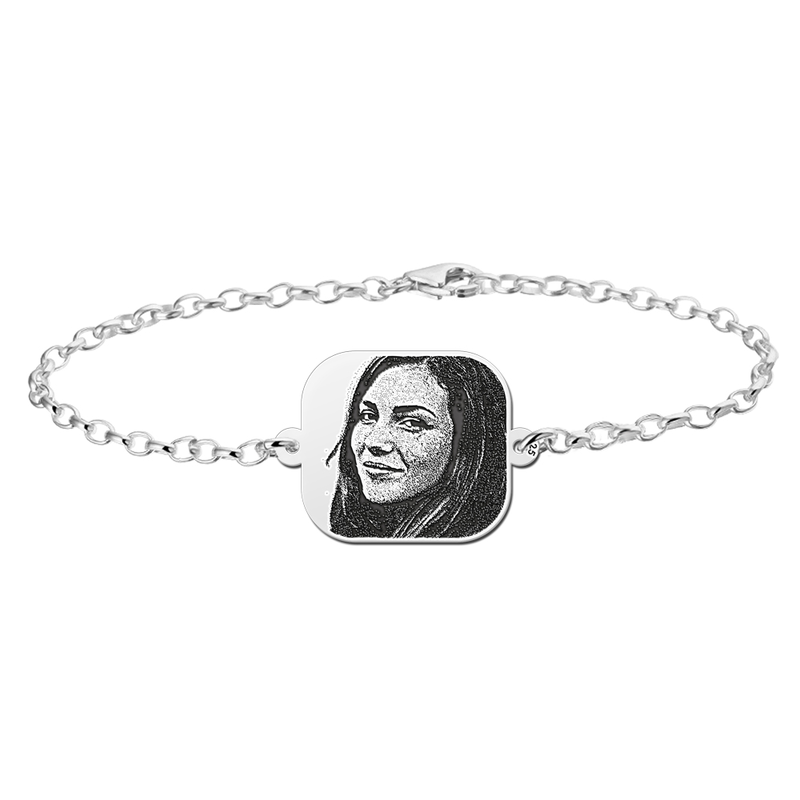 At Names4ever you can order a bracelet with a picture easily and securely. 1. Take a nice photo with a loved one or maybe a pet? Capture a beautiful moment. 2. Select your desired bracelet and upload a photo. Also select the size of your bracelet. 3. As soon as your order is placed we will process it. We will send you a draft (as a picture) of your desired bracelet by e-mail. 4. As soon as we have received a confirmation from you, your piece of jewellery will be produced. Keep track of your mail! 5. You will receive your photo bracelet with picture normally within 10 working days. You will receive your piece of jewellery in a beautiful jewellery box. Do you have more questions? Please contact our customer service . Names4ever has a wide selection of photo jewelry. In addition to bracelets with photo we also offer photo pendants and charms. You have the choice between many different shapes. There are heart-shaped, oval, round and rectangular pendants. Each shape comes with further variations and sizes. Photo jewelry is also very popular as a memory jewelry. Our memorial jewelry also offers the possibility to create jewelry with your own handwriting or even fingerprint jewelry. Questions or remarks? Contact our customer service or view our FAQ.